Our 30 car rental offices in Paris makes it easy to collect and return your hire vehicle. We have rental branches at Charles de Gaulle Airport and Paris Orly Airport West, as well as a wide range of locations in the suburban areas such as Clichy Batignolles, Gambetta and Porte d'Orleans, making it easy to hire a car for your weekend city break or longer vacation. A quick scroll through our drop-down list reveals the exact locations of all of our rental offices in the city. Click on the second tab of our Sixt branch menu to open a useful overview map showing all of our Paris rental locations. Individual branch pages provide exact address details and useful information such as opening times and addresses. Many of our Paris branches offer 24 hour return of your vehicle, making it easy to fit in return around your schedule. A brief car hire price comparison will draw attention to our affordable prices, which you can take advantage of by either booking online or calling our reservation line. We do our best to provide you with a vehicle of your choice but are not able to guarantee a specific model. We are always on hand to provide you with assistance, whether you are looking to book a car for a day or need a rental vehicle for a few weeks. We are proud to offer a wide range of rental cars in our Paris fleet, comprising family saloons, estate vehicles, minibuses and vans. If you want to treat yourself for your car rental in Paris we also offer a range of luxury vehicles, such as sports cars and convertibles from premium car brands such as BMW, Jaguar and Mercedes-Benz. Once you have searched for a quote for car hire in Paris online you will be presented with a list of affordable options, making it easy to carry out a price comparison. As the streets in Paris tend to be narrow and parking is limited, a compact hatchback is a great choice for vehicle hire if you are going to be travelling around the city centre frequently. Perhaps you are travelling around the countryside on the outskirts of Paris, in which case you may prefer to select a 4x4 for your car hire to make travelling the rural roads easier. Larger families or business parties may wish to opt for a minibus or van to transport goods. Please note that our fleet of rental cars has options for differing levels of mobility. You can add extra value to your car rental in Paris with our practical range of extras. If you are unfamiliar with the area you may wish to add a Sat Nav to your rental vehicle, include additional insurance for added peace of mind or have a child seat for driving with a young child. You can add another driver to the car hire in Paris so that you can share driving duties and make sure that you are each properly rested. You can also choose a hybrid vehicle or kit your vehicle out with a ski rack if you are heading to the slopes. Paris' ring-road system can be complex and somewhat intimidating for those unfamiliar with the area, so when you hire a car it is a good idea to opt for a Sat Nav as an add-on. You can circumvent the busy centre of Paris by taking the A86, Paris' equivalent to the M25 in London. The Boulevard Peripherique is similar to London's north and south circular roads, in that if you miss a turning you will need to go around again. This makes it vital that you plan travel in Paris well and stay vigilant for the correct turning. Due to strict motoring restrictions be careful to comply with speed limits and you should also be aware that speed-camera or radar detectors are illegal in France. During the evening and late at night, traffic is lighter, allowing you to get around the city at your leisure. If you will be driving near the Arc de Triomphe, you can avoid the confusing Étoile roundabout by using either rue de Presbourg and rue de Tilsitt, two streets that form a ring around the Étoile and avoid you having to cross the busiest roundabout in Paris. Paris offers the highest concentration of tourist attractions in France, showcasing some of the world's most famous museums, a scenic river view and a wide range of historic monuments. However, it is worth setting time aside to visit some of Paris' lesser-known attractions to experience the city's hidden gems. On rue de la Bûcherie, you'll find Shakespeare and Company, a bookstore that was opened in 1951 by an accentric American called George Whitman. The bookshop has a 'Tumbleweed' tradition, where guests must write a biography and help out for an hour or two around the shop. There are 13 'book shelves' which in fact convert to beds at night and around 40,000 people have slept in the shop. Bois de Vincennes is Paris' largest public park, located on the eastern edge of the city. It was created between 1855 and 1866 by Emperor Napoleon III and features lush greenery, scenic walks and hire boats to take out on the park's four lakes. Notre Dame de Paris, also known as Notre-Dame Cathedral or simple as Notre-Dame, is a famous medieval cathedral on the Île de la Cité in the fourth arrondissement of Paris. The cathedral is the setting of the Hunchback of Notre Dame legend and is considered to be one of the best examples of French Gothic architecture. 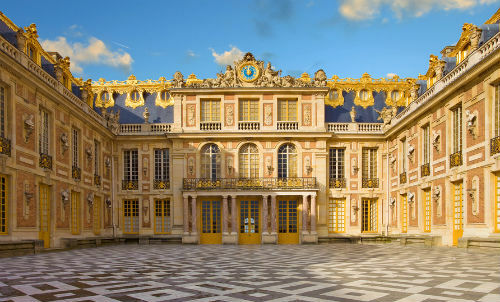 Paris is not only home to some of the emblems of France's history, but is one of the most important political, financial and business hubs in the world. 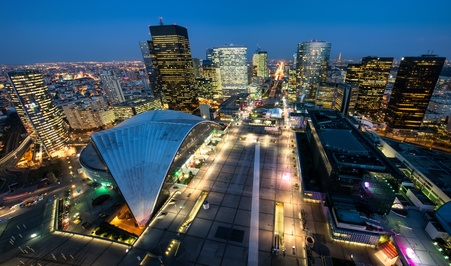 The city's major business district is known as La Défense and is situated just west of the city, as part of the Paris Metropolitan Area. This business district spans 1400 acres of glass and steel buildings, almost 200,000 daily workers and 3,500,000 square metres of office space. At the centre of La Défense is the City le Cnit building, which has over 3,000 square metres of contemporary space for hosting conferences, training days and corporate retreats. Several important corporations have headquarters at La Défense including Neuf Cegetel, Société Générale and Areva.